Let’s start with how you dye only specific parts of the cell or proteins of interest. 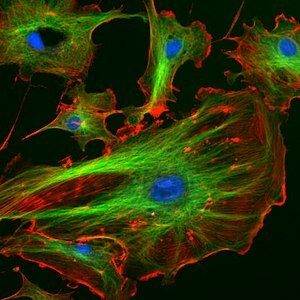 In order to do this we use antibodies (just like those found in our own bodies that help fight infection) bound to different colors of fluorescent dye which is why this technique is also commonly referred to as immunofluorescence. 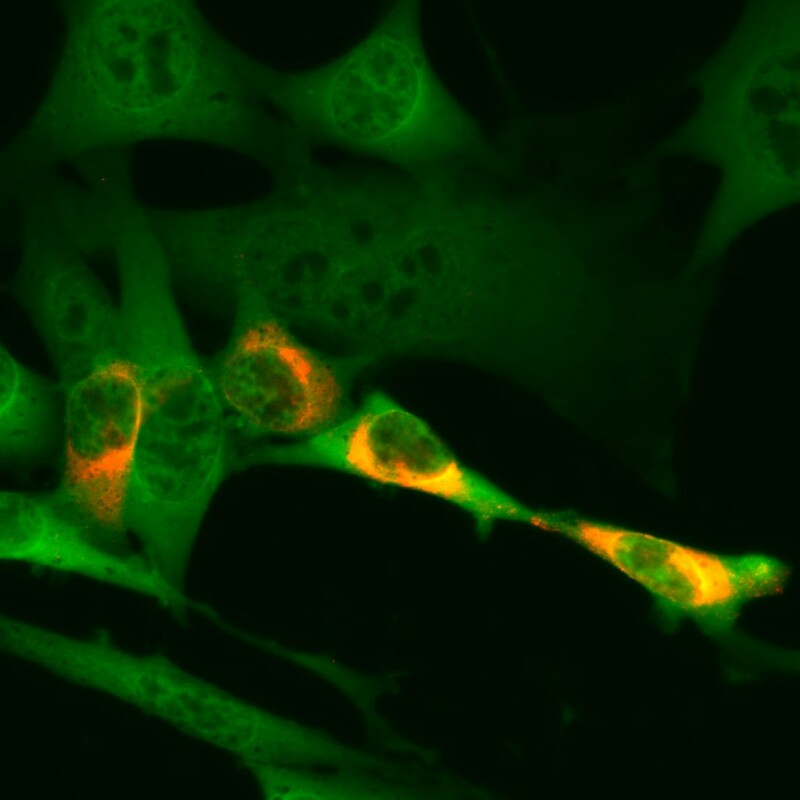 This is called “direct” immunofluorescence because the antibody that has the dye directly binds your target of interest. In the image above, I used “indirect immunofluorescence” to label what I wanted. This is more complicated than direct immunofluorescence because you need to use two different antibodies: one specific to your target, and then a second dye-bound antibody that targets your primary antibody. This is usually done by having the primary antibody be specific to one epitope (in this case the West Nile Virus surface antigen) and made from mouse antibodies. The secondary would then be “anti-mouse” antibodies from a different animal (say a goat) that are conjugated to a dye; in this case the red Cy3. 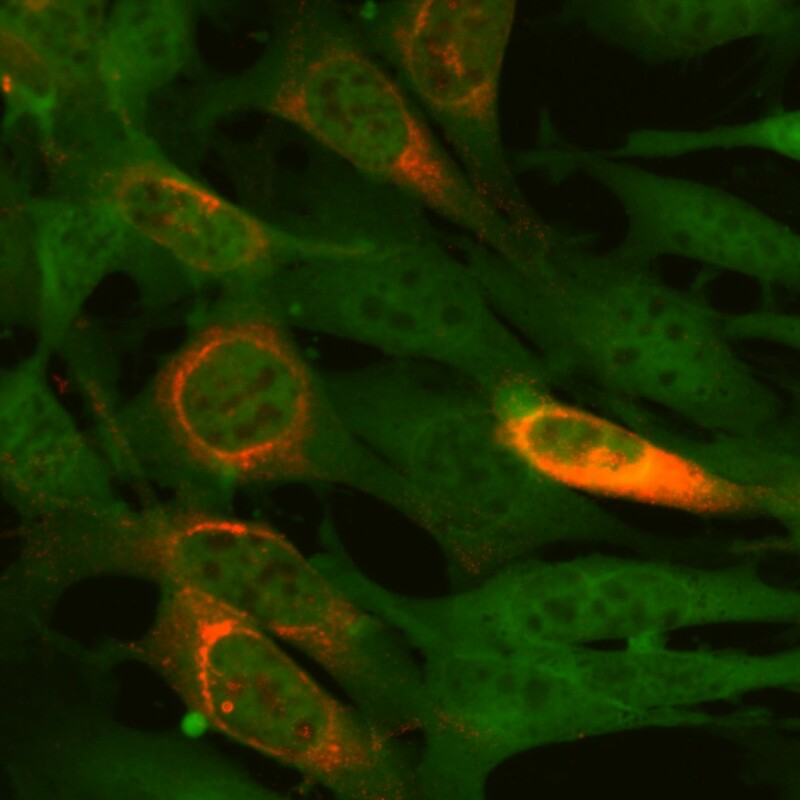 This secondary antibody allows you to image where the primary antibody has bound and allows for more flexibility in labeling. This is how scientists can image specific parts of cells without labeling everything in the cell. However, it is important to remember to wash off unbound antibody from the samples before imaging, as residual unbound antibody will still fluoresce on a slide and lead to imprecise labeling or background haze in the image. So now that we know why parts of the cell get labeled, why are they green or red or even yellow for that matter? The red and green images are simple to explain: the fluorophores that I used for this image fluoresce green (my general cell label) or red (for West Nile). The yellow color takes a bit more background to understand, because we need to know how light behaves. Most of us are familiar with what happens when you mix red and green paint, you get various shades of brown. This is known as subtractive color system. However, when red and green light are mixed they make yellow, also referred to as an additive color system such as computer monitors and televisions. When the red light and the green light are present in close proximity and similar intensity our brain will perceive this mixture as yellow. Add blue at a similar intensity and the image would appear white. This allows us to no only determine if an epitope is present in the cells, but if our targets of interest are located in the same region based on how the light mixes. While this is a very basic explanation of the science behind these images (the physics of light are for another day), I hope that now you have a better understanding of how these images are generated and how to interpret images that you come across in the future such as the image to the right. With this information in mind you may want to look at the Nikon Microscopy U Small World image competition winners for 2011, they are stunning images. I really wanted to type a small note in order to thank you for the amazing solutions you are placing here. My prolonged internet research has at the end of the day been paid with brilliant details to go over with my family. I ‘d admit that most of us readers actually are very much blessed to be in a magnificent community with so many special individuals with helpful tricks. I feel rather lucky to have encountered the webpages and look forward to so many more pleasurable times reading here. Thanks once again for all the details.